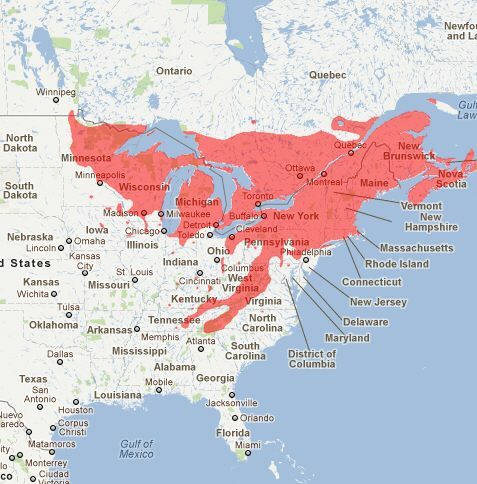 North America: Yellow birch, sweet birch, and paper birch grow principally in the Northeastern and Lake States. Yellow and sweet birch also grow along the Appalachian Mountains to northern Georgia. Paper birch is also found throughout Canada and Alaska. Yellow, sweet, and paper birch are the source of most birch lumber and veneer. Birches can reach a height of 70 ft, with a diameter of more than 2 ft.
General: The wood varies slightly among species. The wood of yellow birch and sweet birch is heavy, hard and strong, while that of paper birch is lighter, and less hard, strong and stiff. All birches have a fine, uniform texture. Paper birch is easy to work with hand tools; sweet birch and yellow birch are difficult to work with hand tools and difficult to glue, but easily machined. Yellow birch has white sapwood and light reddish-brown heartwood. Sweet birch has light-colored sapwood and dark brown heartwood tinged with red. Working Properties: Working properties may vary with species. In general, birches split during nailing; if successfully nailed, they have good nail-holding properties. Durability: Rated as slightly or nonresistant to heartwood decay. Uses: Yellow and sweet birch lumber and veneer are used principally in the manufacture of furniture, boxes, baskets, crates, wooden ware, cooperage, interior finish, and doors. Birch veneer goes into plywood used for flush doors, furniture, paneling, radio and television cabinets, aircraft, and other specialty uses. Paper birch is used for turned products, including spools, bobbins, small handles, and toys. Also used for pulp wood, fuel wood, turnery, distillation products, toothpicks, ice cream sticks and tongue depressors.